Reflecting on the Microsoft co-founder's legacy. Two years ago, Bill Gates announced his plan to leave Microsoft as a full-time employee and turn his attention instead to the Bill & Melinda Gates Foundation, the largest philanthropic organization in the world. The years since haven't been Microsoft's best: Its Vista operating system bombed, and online, the software company lost further ground to Google, a failure culminating in its now-best-forgotten effort to purchase Yahoo. Gates' reputation, though, has only improved. Today is Gates' last day at Microsoft; he will continue to serve as the company's chairman (and will remain its largest shareholder), but he's said he'll spend 80 percent of his time at the foundation. Once the most despised fellow in business, in the last decade, Gates' philanthropic work has cemented his standing as ... there's no casual way to say this, he's the leading statesman of our times. The transformation has been so complete it seems difficult, anymore, to reconcile the old Bill and the new. Though you sometimes see flashes of the combative businessman -- Gates told Tom Brokaw the other day that he doesn't use an iPod because "the Zune is a better way to carry your music around" -- these moments seem contrived for comic effect. Caring about which music player wins the market is laughably frivolous beside Gates' grand ambitions of eradicating the planet of infectious diseases and the ravages of poverty. Bill Gates has pulled off one of the greatest hacks in technology and business history, by turning Microsoft's success into a force for social responsibility. Imagine imposing a tax on every corporation in the developed world, collecting $100 per white-collar worker per year, and then directing one third of the proceeds to curing AIDS and malaria. That, effectively, is what Bill Gates has done. Dash also points out the neat symmetry to Gates' career. In 1980, Mary Maxwell Gates, Bill's mother, got to know John Opel, the chairman of IBM, through their work at the United Way Foundation. At the time, IBM was preparing to release the first PC, and it needed an operating system. Opel chose tiny Microsoft as its OS vendor partly on the strength of his connection to the Gates family -- a decision, Dash writes, "that ended up being the greatest turning point in the history of the biggest software company that's ever been created." 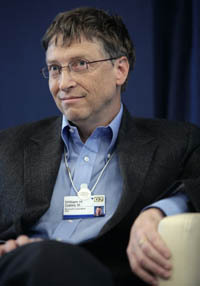 Philanthropy played a key part in Gates' early success at Microsoft. And in a hundred years, philanthropy may be all anyone remembers him for.